Glenohumeral instability makes up the majority of serious shoulder injuries in football players. These injuries most frequently occur during the competitive season and are especially common in goalkeepers. Young athletes are at an increased risk of recurrent dislocation and may be surgically managed to reduce the rate of instability. Traditional open as well as arthroscopic Bankart repairs have excellent results with excellent rate of return to play. In the presence of significant glenoid bone loss, bone block procedures such as the Latarjet technique have been successfully utilized. 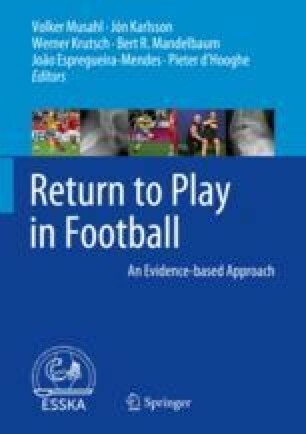 Unlike other sport activities which may involve more direct physical contact and overhead activities (rugby, American football), outfield football players can often return to unrestricted play much sooner at 12 weeks. The clinician should consider the pathologic changes, position-specific demands, and the athlete’s motivation when counseling the player about the most appropriate management options.